You are here: Home 2015 August How to Use the Most-Used Cisco 7911 Phone? How to Use the Most-Used Cisco 7911 Phone? It is said that Cisco 7911 Phone was used most in the Cisco IP Phone 7900 Series. Are you a Cisco 7911 user? Are you familiar with all the buttons of Cisco 7911 Phone? In this article, we will read the Cisco 7911’s buttons and their tasks. 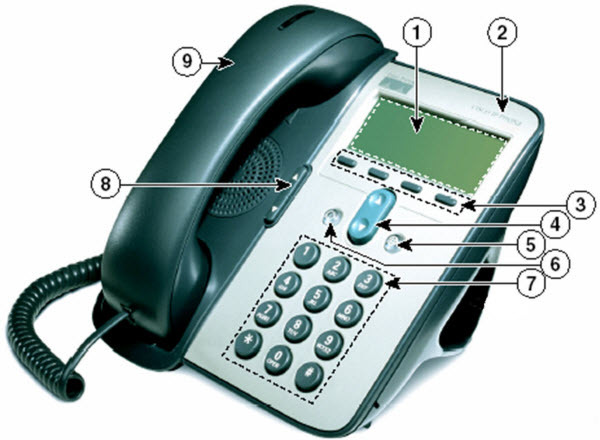 2 Cisco IP Phone series Indicates your Cisco IP Phone model series. 3 Softkey buttons Each activates a softkey option displayed on your phone screen. 4 Navigation button Allows you to scroll through menu items. 5 Applications menu button Displays the Applications menu that provides access to phone logs and directories, settings, and services. 6 Hold button Places the active call on hold, resumes a call on hold, and switches between an active call and a call on hold. 7 Keypad Allows you to dial phone numbers, enter letters, and choose menu items. 8 Volume button Controls the handset, headset, speaker, and ringer volume. 9 Handset w/ light strip The light strip on the handset indicates an incoming call or new voice message. Redial a number Press Redial. Hold/resume a call Highlight the call, and press . Forward Phone Press more softkey, press CFwdAll, enter the 4-digit extension or press the Msgs softkey to forward to voicemail. Note: Do not forward the phone to voicemail by forwarding to x5000, it will not work correctly. Transfer a call Press Transfer, dial the number, then press Transfer again. Conference Call Press, more > Confrn, dial the participant, then press Confrn again. *Note: Not all softkeys are available on all phones.